Courtney and I saw MILK this past Saturday at the Sundance Kabuki Theater in Japantown. It was: Amazing. I've never been in a theater where almost everyone was teary-eyed and sniffling well past the catastrophe into the closing credits. Before hand we wandered through the Japan Center looking for gifts for others were I found these two shopping bags. The teenage Asian girl in me had to have them for myself. I'd never seen Angry Little Girls before. They're pretty hilarious. I just love belligerent cartoon characters. I've got to admit, when I went shopping at Trader Joe's today I felt a little silly loading my groceries up into these bags. But seeing as I live in SF not many people look cross-eyed at a hulk of a man walking down the street carrying something meant for tween girls. Or at least I don't notice them looking at me cross-eyed. If you remember a few months ago my flat was being overrun with mice. 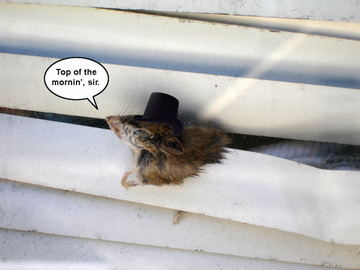 My roommate postulated the rodents were coming from the Crazian* landlady's flat below us. Made sense to me since she's a pack rat. 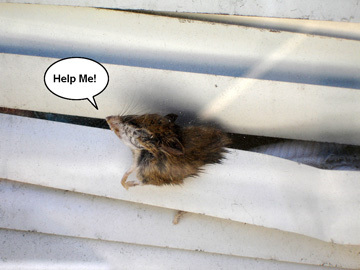 He informed me a week ago that a mouse was stuck in the mini blinds of one of her bay windows. The mouse has been dead for awhile but strangely isn't decomposing. This picture was taken a full seven days after he first told me about the mouse. I haven't seen the Crazian landlady in awhile. Yesterday a citation was posted on her door from the SF Department of Building Inspection. Among the various violations listed, one had to do with not accepting a certified letter. That leads me to suspect she isn't answering her door. Conclusion: she's perished in her flat and has been mummified as a result. I've decided that this mouse is English and his name is Percy, short for Perciforth. To deal with his dead body being on display I have given him a top hat which gives him an air of distinction. I'd give him a coat with tails but he's already got one. *Crazian, noun & adjective, a portmanteau of crazy and Asian, not to be confused with Craisins® Sweetened Dried Cranberries by Ocean Spray. Ever skim an article and then laugh at how ridiculously you interpreted a sentence? Today while skimming the news I read about Deborah Palfrey, the D.C. Madame who a few days ago, "passed herself away" (to borrow a quote from "Girls Will Be Girls"). I was interested enough to read about her suicide note so I clicked an article that was being displayed on the main page of Google News. And this is what I thought I had read which made me laugh. I guess I could have read she hanged herself with her mother's tampon strings but thankfully my mind didn't go there, well at first. Last night, while sitting on my bed and talking with my mother (I'm such a good boy) I saw a mouse run across the floor. Alarmed, my senses were instantly heightened (ah, there's nothing like a shot of adrenaline to make one feel primitive.) Since November of last year there have been periodic mice parades in the flat. I don't even know how many mice my roommate has humanely trapped since last year. I do know this was the first one to have invaded my room and for that I was, and still am, pissed. This mouse wasn't too afraid of me. It would come out from behind furniture and stop, take a cigarette break, talk on its cell phone and then go back to searching for, what? Food or a place to nest? I broke out a snap trap I purchased for an art project, slathered it with some peanut butter and went back to my room intent on killing. After setting the trap up I got on my bed and waited. The mouse had no desire to go near the trap and who can blame it? After waiting an hour I went and got one of the humane traps from the laundry room. I filled it up with a cracker and peanut butter and placed it on the opposite wall of the room. Certainly the mouse would have to choose one or the other. Life or death. I felt kind of god like giving this bugger a choice. But the little turd dropper didn't go near either trap. I wasn't comfortable going to sleep knowing a mouse was scurrying around my room. I turned off the lights and tried to meditate but the little paw steps kept me from reaching any sort of peaceful state. I flipped the light on and the mouse was running across one of the windowsills. It looked in my direction, jumped and flew through the air ending up behind my dresser. Now I felt real uncomfortable. This wasn't any ordinary mouse-- it was part Mighty Mouse. Regardless of my feeling I ended up falling asleep only to be woken up two hours laster by the sound of rustling paper. I got out of bed and flipped on the lights. The mouse was climbing up the cork bulletin board I have above my desk. Now the mouse was part Spiderman. The light startled the mouse. It jumped down from the board onto my Klipsch speakers where it waited just long enough for me to grab a boot. I threw the boot as hard as I could, knocking everything off the desk but the mouse was unscathed. It jumped off the desk , thumbed its nose at me and disappeared underneath the credenza. I was too uncomfortable to go back to sleep in my room, thinking I would wake up with the mouse having bit my jugular vein. I gathered up a pillow and a throw blanket and left my room to go sleep on the couch. There I dreamt of mice, female teachers as sexual predators, tiger cubs and illicit drug use. When I woke up at 5:30 in the morning I check the traps but both were empty. I haven't been home since I left this morning. I'm hoping one of the traps will have the mouse detained, either temporarily or eternally. Update 4/4/08 11:43PM: Just came home from taking Brent out to dinner for his birthday. Still no mouse. Update 4/5/08 6:32AM: A snap woke me up! Unfortunately neither trap was set off and it turned out that the TV remote control fell and hit the floor. It's irksome the mouse doesn't want to relocate and/or die. A boyfriend and a pet dog are pretty similar, right? I mean they're both more responsibility than I've wanted for quite some time. According to my best estimate it’s been 31 months since I last steadily dated one person. Come to think of it, the same amount of time has passed since I had full time pet responsibilities—that’s when I shipped Macy off to die at my parents (sorry about that mom, dad & sis). Sure I’ve pet sat since Macy, just like I’ve been out on a handful of dates, but nothings stuck mostly because I haven’t wanted it to. Thinking of dating again long term brings up many of the same issues I have with getting a dog: do I really want to deal with the shedding? Do I really want to deal with the passing of gas in my bed? Do I really want to take him out for walks every day? Maybe I do. I should warn my family, if things don’t work out, to expect a much larger visitor to euthanize.